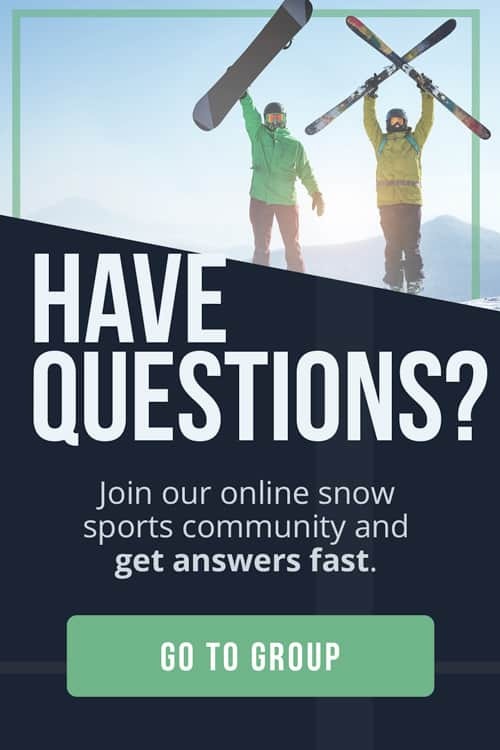 DO I NEED TO BUY EQUIPMENT BEFORE TRYING OUT A SNOW SPORT? WHAT EQUIPMENT DO I NEED TO RENT? MY BUDDY HAS GEAR. CAN I JUST USE HIS? WHAT CLOTHING DO I NEED TO GET INTO SNOW SPORTS? WHAT KIND OF HEADGEAR DO I NEED? CAN I GET INTO SNOW SPORTS WITHOUT SPENDING A TON OF MONEY ON GEAR? WHAT KIND OF PHYSICAL SHAPE SHOULD I BE IN? WHAT’S THE MOST INEXPENSIVE WAY TO LEARN A SNOW SPORT? SHOULD I LET MY PARTNER, SPOUSE, OR FRIENDS TEACH ME TO DOWNHILL SKI OR SNOWBOARD? WHAT ABOUT LESSONS FOR NORDIC OR CROSS-COUNTRY SKIING? I’M OUT OF SHAPE. WHERE SHOULD I START? HOW DO I FIND OTHER PEOPLE TO DO SNOW SPORTS WITH? LIFT TICKETS AT SOME SKI RESORTS ARE EXPENSIVE. IS THERE ANY WAY TO GET DISCOUNTED LIFT TICKETS? WHAT SHOULD I CARRY IN MY POCKETS? Perhaps you’ve met a few skiers. With a light in their eyes, they regale you with tales of their best powder skiing. Their enthusiasm is infectious. You want to join in the winter fun, but have no idea how to begin. No worries. The Adventure Junkies are here to give you answers on how to get into snow sports. It’s not as hard as you think. In fact, there are easy ways to test out wintertime fun, and getting into winter sports might be less expensive than you think. 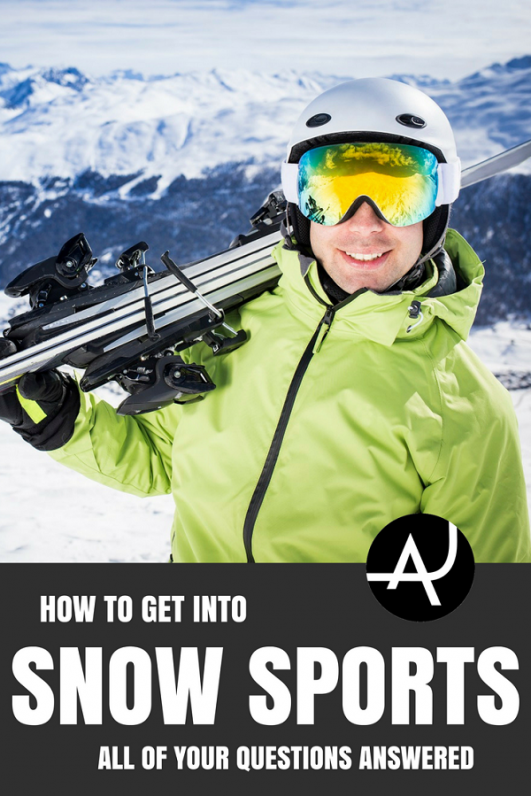 So let’s tackle the most frequently asked questions about getting started in snow sports. No, before you buy equipment, you should first try out a snow sport. Ski shops and ski areas rent equipment. When you tell them you are a first timer, the shop technician will get you set up with the right gear sized for you. Rental gear is available for all snow sports. You can rent gear at downhill ski resorts, multi-sport ski areas, groomed Nordic centers, and winter outdoor shops. 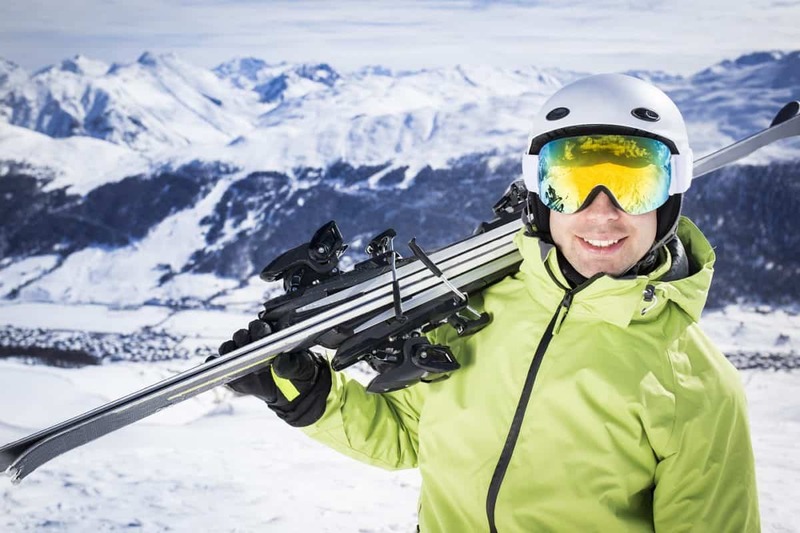 Most carry rental packages for downhill skiing, snowboarding, Nordic skate or classic skiing, cross-country skiing, and snowshoeing. 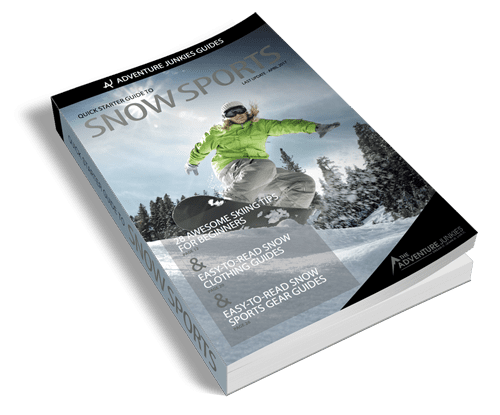 Each snow sport has specific needs. So, you must rent the right gear. For instance, you don’t want to rent big, fat, heavy downhill skis to use for gliding on a flat groomed track in narrow slots. Likewise, if you plan to Nordic skate ski, you’ll get more propulsion from poles that are chin high rather than the shorter poles used for cross-country touring. But don’t worry about remembering the specific gear needs for each discipline. Rental shops will outfit you with the right stuff. You just need to decide what winter sport you want to try out first. Rental packages include downhill or alpine skis, boots, and poles. Helmets usually cost extra. Rental packages include a snowboard and boots. Helmets usually cost extra. Classic and skate skiing are two different disciplines with different styles of gear designed for propulsion by skating in a groomed lane or by striding in parallel tracks. Rentals for both disciplines include skis, boots, and poles. For ski touring on ungroomed trails, rental packages include skis, boots, and poles. For walking on snow, rentals include snowshoes. Poles often cost extra, but add stability. You’ll need your own pair of hiking or snow boots when renting snowshoes. It’s not safe to borrow gear from friends or relatives. Bindings may not be set appropriately for your weight, height, age, and skill level. That’s imperative, as better skiers will use higher settings that require more force to release. As a beginner, you need lower settings for the bindings to release to reduce the chance of torquing knees in the wrong direction. Also, your buddy’s gear may be ill-fitted for you. For instance, height and weight make a difference in the ski length. Learning on skis that are too long or too short makes the sport more difficult or causes adapting to incorrect stances to compensate. You will need to rustle up winter clothing for snow sports. You can borrow or buy. A few ski resorts rent jackets and pants, but that isn’t a universal service. Think in terms of layers. Begin with a wool or polyester long underwear bottom and top. Add a fleece or wool layer after that. The number of layers you add will depend on outside temperatures, wind, and the thickness of your outer layers. For outer layers, a water-resistant or waterproof shell or snow jacket will ward off the elements. Snow pants keep the legs warm, while rain pants can also work over double layers beneath. For feet, snow socks are designed to pull on high above boots. For hands, mittens are usually warmer than gloves. For downhill skiing or snowboarding, opt for more layers and more insulated fabrics than for Nordic or cross-country skiing. Headgear will add warmth and protect your ears from frostbite. Hats should cover the ears. 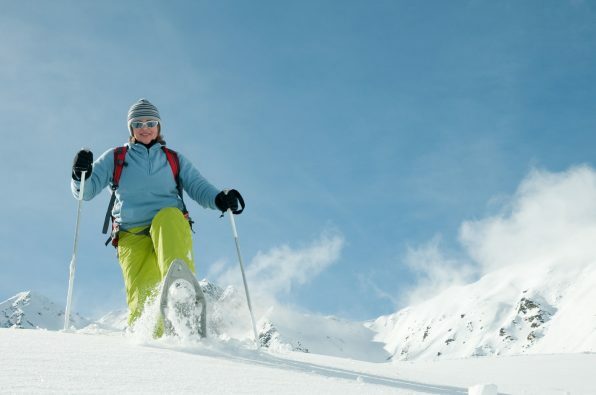 For downhill skiers and snowboarders, neck gaiters or tubes also prevent snow from getting into your jacket and can protect the lower face from wind or blowing snow. Usually, Nordic skiers and snowshoers only wear neck gaiters on the coldest days. If you plan on downhill skiing or snowboarding, you’ll also need goggles and a helmet. Goggles keep your eyes from watering from blowing snow, and a helmet protects the head in falls. For a sunny day, sunglasses need to have strong enough UV protection to lessen snow glare. Even if you don’t have a wad of cash, you can get into snow sports. Renting gear during your first winter, rather than buying it, will let you figure out the sport first. Rental shops also carry demos. These are equipment they want to sell rather than rent. But renting them out lets you test out several styles, options, or brands. Once you decide to purchase gear, go to a resale outdoor store to buy used gear. Especially in ski towns, these shops can carry some used skis, snowshoes, boots, and poles that are still in great shape. Ski clubs often hold ski swaps for selling used gear and raising money. You won’t be able to jump from sitting on the couch for six weeks right into skiing. But you also don’t need to be a world-class athlete in order to start a snow sport. If you get a moderate amount of exercise, you can pick up a snow sport. If you are worried you may not have the strength for skiing or snowboarding, start with snowshoeing first. Without the need to slide, snowshoes are more stable, especially if you add poles for balance. Start with a short one-hour tour before adding more distance. To prepare yourself for the slopes and lessen the risk of injury, get to the gym. Any exercise will help, but classes are also available that target ski conditioning. Downhill skiing and snowboarding are the most demanding winter sports to pick up, so do your body a favor by getting in shape. For learning to ski or snowboard in North America, January is the best month to try it out. That’s Learn to Ski or Snowboard Month when many ski areas and sports shops run the best deals for beginners. Packages bundle up a rental package, lesson, and lift ticket. You can find a list of participating resorts online. The World Largest Lesson takes place on one day in early January. Lessons vary with the start time, depending on the time zone. That way they all happen concurrently. It’s an annual attempt to get in the Guinness Book of World Records. Most ski areas also offer beginning skier or snowboarder packages all winter long. They are also called “first timer,” “never ever,” or “easy rider” programs. They include a lesson, lift ticket, and rental package. Some resorts make learning a three-time deal. These are called “1-2-3 Ski” or “1-2-3 Ride.” They include three days of lessons, lift tickets, and rentals. The program usually does not require consecutive days. No! Letting friends, spouses, or partners teach you to ski or snowboard only invites disaster. Most people do not have a thorough understanding of teaching techniques for beginners or understand the appropriate progression of skills that need to be mastered. They often get impatient and just want to take a beginner to the top of the mountain. That results in the beginner getting scared, often to the point where he or she refuses to pursue the sport again. Here’s a classic saying: “Friends don’t let friends teach friends.” In fact, friends don’t often stay friends after trying to instruct the other. It’s better to learn from a pro. Most pros are affiliated with the Professional Ski Instructors of America (PSIA) or American Association of Snowboard Instructors (AASI). Professional ski and snowboard instructors learn techniques to help first timers pick up snow sports. They also have the ability to analyze the physical position of the body over the gear and can offer tips to help the body move into its correct position to master skills successfully. The pro’s instructional skills help students master techniques faster. Most groomed Nordic centers offer instruction in skate and classic skiing. Some instructors are certified through the Professional Ski Instructors of America (PSIA). While some skiers can pick up techniques on their own, you’ll progress much faster with more confidence and correct body positions for more efficient movement if you start out by taking lessons. Learning to ski on a groomed track first is also good preparation for cross-country ski touring on ungroomed trails. Snowshoeing lessons are rare. If you can walk, you can snowshoe. But if you are nervous, join a snowshoe tour to be with others who can give you tips. Maybe. 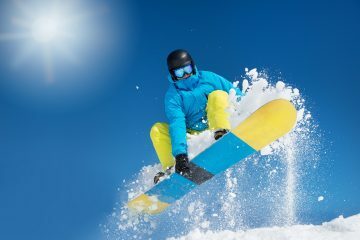 But if you take lessons from a pro, you’ll reduce the chances of injury from incorrect techniques or getting on a slope above your skill level. Renting gear from a ski shop will also lessen the chance of injury as technicians will set bindings specifically for you. When learning, stick to beginner runs denoted on signs and trail maps by green circles for safety. Do not let someone else talk you into going to more difficult slopes. Avoid going on intermediate runs (blue squares) or advanced and expert runs (black diamonds) until you have mastered the skills for them. Start with snowshoeing. It’s the least intimidating of the snow sports. It’s also the cheapest, as you don’t need lessons or lift tickets. The rental shop can instruct you in how to put the snowshoes on and take them off. Use poles for stability. Other than that, it’s a matter of walking. You can walk as little or as long as you can. Maybe. That’s why lodges that sell hot chocolate. When you get cold, go inside to take a break and warm up. But avoid alcohol. Alcohol can lower your core body temperature. Once that happens, your body will struggle to warm up by pulling heat in from the extremities. To keep warm and dry, do not wear any cotton clothing. Cotton absorbs water and will not dry out through wicking. Dress in layers that are waterproof, water resistant, polyester, wool, and wicking. Use a neck gaiter to prevent snow from going down your neck. Wear a thin hat under your helmet. You can also purchase small chemical heat packs to keep your hands or toes warm. The packs fit inside gloves or mittens and thinner ones go inside boots. To find companions for winter sports, look for ski clubs in your area. 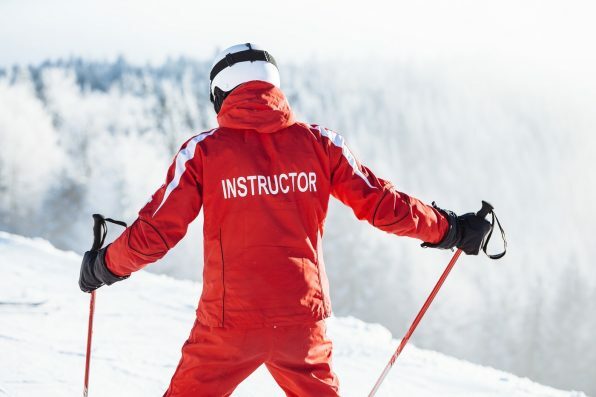 Many resorts also have multi-week group lesson instruction where you’ll meet other skiers at your skill level. Many ski resorts design discount programs, such as ticket packs or advanced online purchasing. If you plan on being a frequent skier at one area, you should consider a season pass. 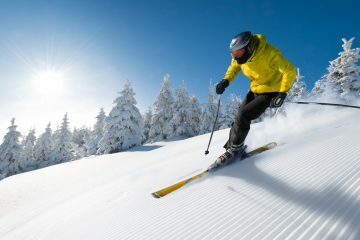 For North American ski resorts, Liftopia and GetSkiTickets offer discounted lift tickets online. But they must be purchased in advance for specific dates. For outdoor winter sports, toss a few items in your pockets to improve your day. An energy bar can revive you when you get tired. With cold, wind, and sun, the lips will chap fast. Lip balm with sunscreen can protect you. A tiny bottle of sunscreen also helps when you need to reapply protection midday.